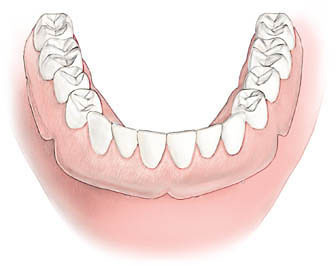 A full denture replaces a full arch of teeth. Conventional full dentures are removable, but new advancements have allowed practitioners to anchor your full denture using dental implant posts, clips or bonding materials. While nothing can perfectly replace your natural teeth, new advancements in denture technology have made dentures more comfortable and stable than ever before. We also offer removable partial dentures for areas of your mouth where teeth have been lost or extracted. These are held in place by metal or plastic clasps that affix to surrounding teeth. Removable partial dentures serve as an alternative to fixed partial dentures (bridges) or dental implants. They can help to restore aesthetics and function to areas with several missing teeth. Dental implants can now be used to anchor partial and full dentures. This prevents the slipping, irritation, and pain associated with "floating" partials and dentures. It also prevents the tedious removal of dentures for overnight soaking and cleaning. Without the proper fit, dentures can also be uncomfortable and come loose during speaking or eating. If you currently have dentures, or are considering them, dental implants can provide a more comfortable and healthy alternative. Dental implants also eliminate the need for denture adhesives. This allows you to enjoy eating the foods you previously avoided. With dental implants, your partials or dentures are firmly anchored to the jawbone, allowing them to feel much more like natural teeth. River Oaks Dental is rated 4.6 out of 5 based on 76 reviews from around the Web. All the staff ate friendly, accommodating, and professional. I loved all the people who helped me today they were very thorough and professional. I will for sure refer to others.. But they must be doing something right here, I've been coming back to have work done and keep my teeth in my head since 1981...and they've never let me down, always been kind, efficient and affordable. Staff was very professional, kind, courteous and right away I felt welcomed and very comfortable. I have significant dental phobia and sensitivity, and everyone at River Oaks is super understanding. His office staff was great! Great service and patient care. I felt I was taken care of quickly and the Dr. answered all of my questions/concerns. Everyone is very kind and makes sure you’re comfortable! Thank you! I am so impressed. Friendly and competant staff. Excellent dentist! I highly recommend if your looking for a great dental office. Kind, courteous, always smiling. They and Dr Sannar make going to the dentist not such a bad experience. I highly recommend them. Sandeep is a kind and gentle person and these qualities contribute to her being a gifted and thorough hygienist. Staff is kind and professional. Explained equipment and procedures. The amazing staff continually checked on my comfort &,though I was sedated,I was aware of what was happening & the staff advised me of what they were doing every step of the way. You CAN find a Dental location you like! Wow, I can not believe how much I have had done and where I am at. Every experience is pretty fantastic! I hate going to the dentist but they make it so much easier. Thank you!! Great experience, they went over every option and cost available and gave me lots of time and attention. Very professional and a Great staff! The Dentist and assistants are very informative they explain things in layman’s terms which is so helpful . I would give them a 10 + . Staff are very friendly not pushy . they take good care of you right away .provide you with options needed . The staff are very knowledgeable and kind. Jennifer was very good performing my cleaning. I recommend her. Hands down, the best experience I have ever had at a dental office! I highly recommend River Oaks! As usual, my visit today for a cleaning was on time, done well and made my mouth feel great. Will continue going to her. Great experience. My wedding is next month and getting a cleaning / check up totally skipped my mind. Highly recommended . Took my daughter in to have her first “procedure” (tooth pulled) and everyone was amazing and did a great job making her feel comfortable! To my surprise, Dr Sannar has moved from Live Oak to Yuba City. I Have always been afraid of going to the dentist, but Dr. Farr and his amazing staff made me so comfortable. Alexander F. Farr, DDS Charles N. Sannar, DDS (530) 671-2344 1424 Live Oak Blvd.